Each time we travel, we get asked; “What are you packing in your suitcase?!?”. 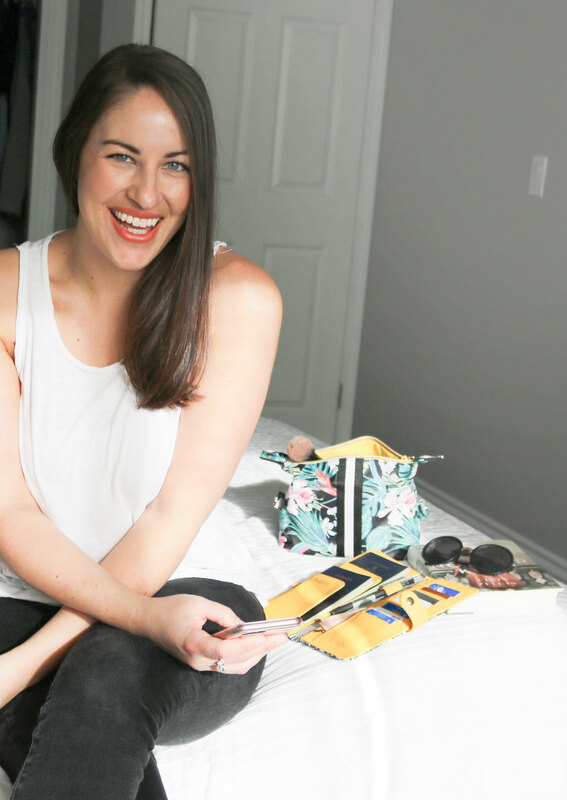 To help you pack for your next trip, we’ve created a list of everything I packed in my suitcase for my honeymoon. 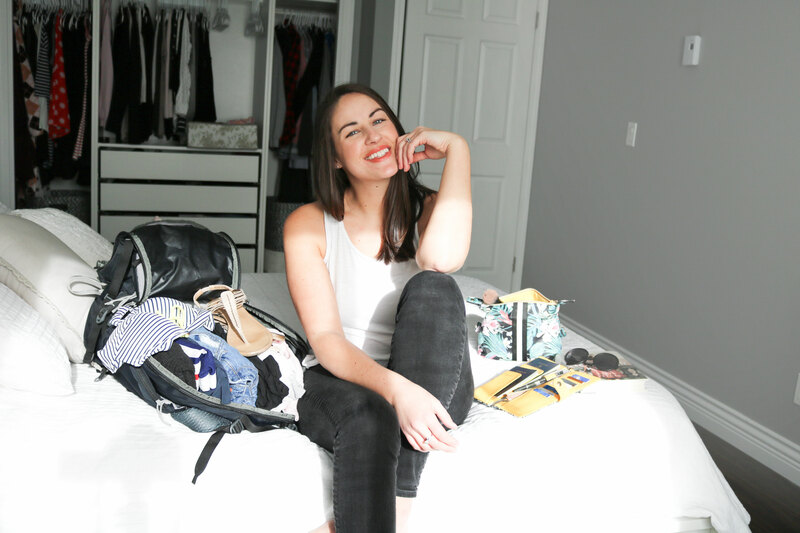 A very complete list from my makeup bag content, to my clothes and to all the miscellaneous items that will make this suitcase the perfect suitcase to travel with! As you may know, I will be traveling to South America in a few days. It’s a special trip for us as this will be our honeymoon!! Yes! I am so excited, I just can’t wait! It will be the first time we will set foot on this continent, one that we’ve been dreaming of visiting for a few years now; South America. We will visit 3 countries during our 19-day journey such as Argentina, Uruguay, and Chile. I packed my suitcase knowing that we will be moving around a lot and are planning less than 3 days per city. To have an enjoyable trip, I will be traveling with my travel backpack. I really like this backpack as it has the perfect size for me. I can fit in just enough with this 30-pound backpack, which my back truly appreciates. Plus, with only 40 liters, I get to use this backpack as a carry-on in the plane and save a few bucks as I don’t need to pay to check-in my bag. I also don’t have to wait around at the airport for my bag to come out, which is also pretty awesome! I’ve traveled quite a bit with this backpack and never once was I disappointed by its performance! #BringsMeJoy. There is nothing that annoys me more than looking for my brushes and my blush for several minutes because my bag is upside down. 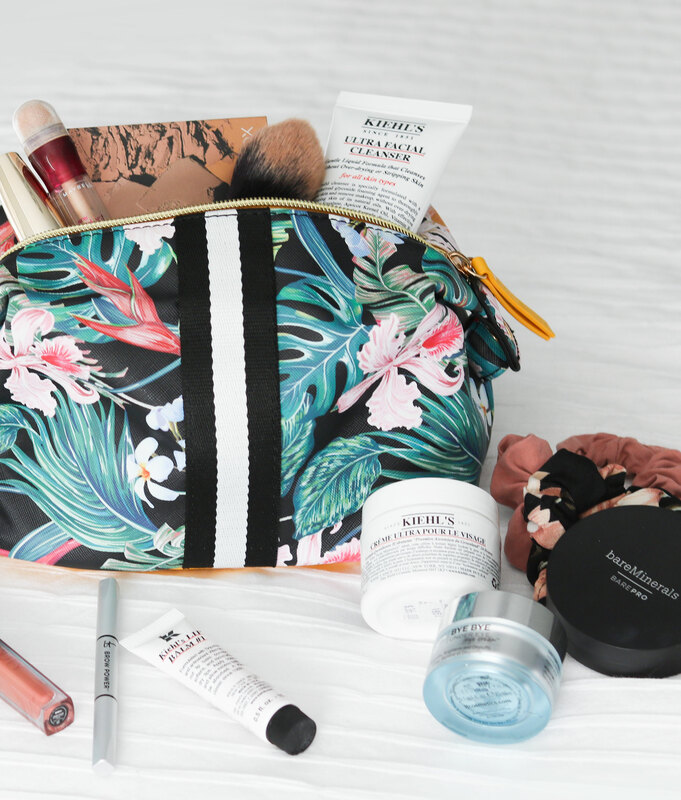 I love this makeup bag to keep my makeup separated from my main travel gear. Now, it’s not because you’re traveling with a backpack that you’ve become a hippie overnight! 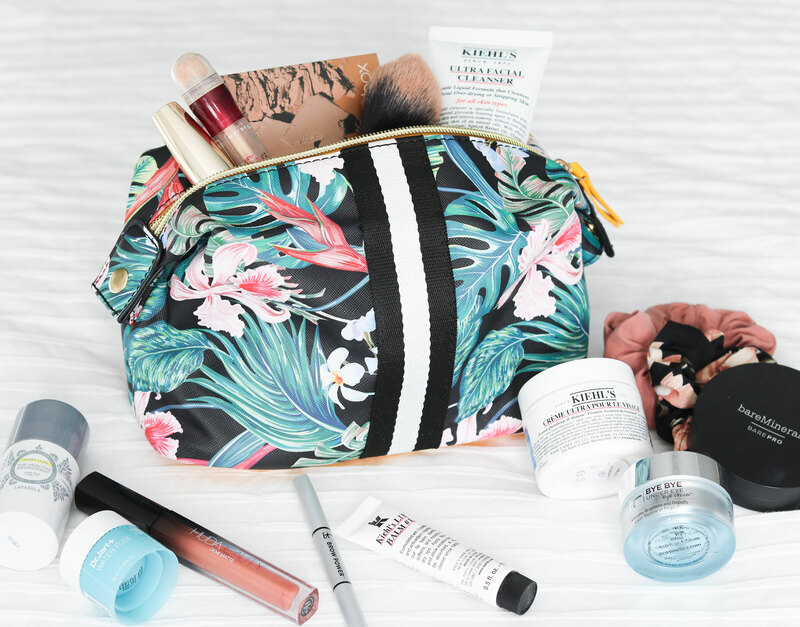 Bizou’s makeup bag has the perfect size to hold all my beauty products. Plus, its tropical leaf pattern fits pretty well with my trip to South America! 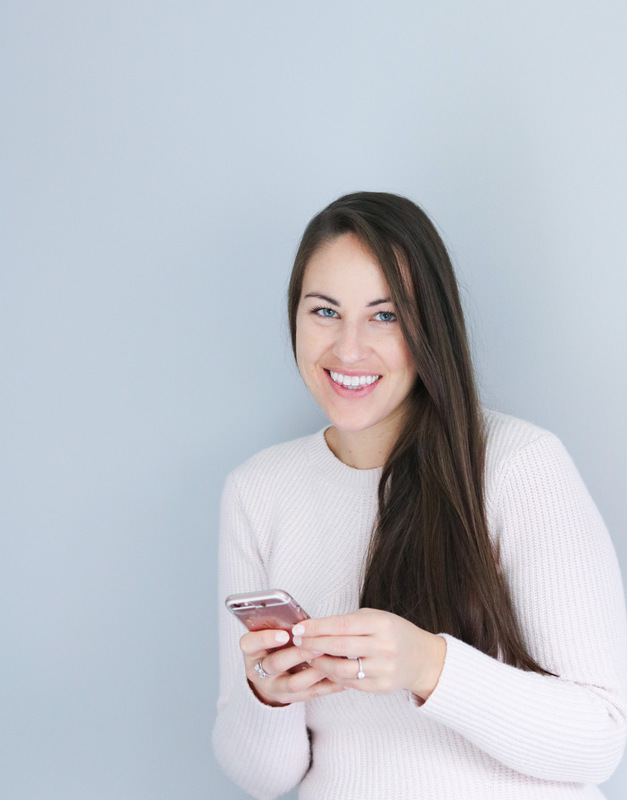 I never travel without my camera! Although it makes me look like a true tourist, I totally assume the look. I plan on writing several blog posts to document my trip to South America and to do so I will need a lot of photos! I’m always traveling with a mini-bag for my camera, I never travel with all my stuff, just what’s needed! 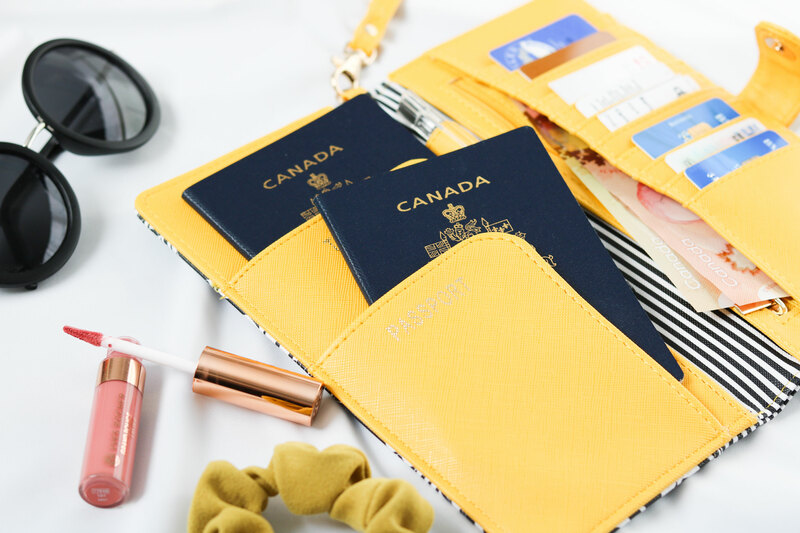 I like to have everything at my fingertips and this passport case is just perfect for that. 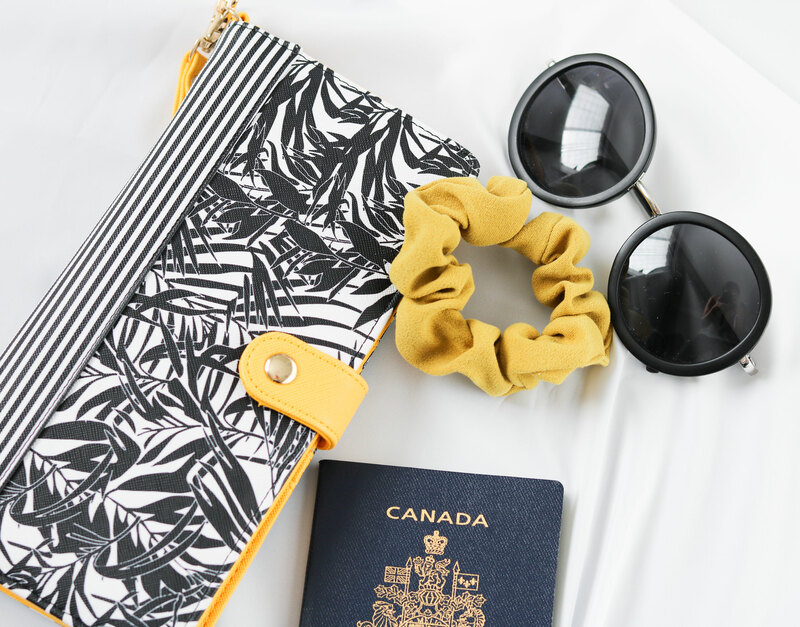 Plus, it’s such a beautiful passport case with its black and white stripe and foliage with a hint of yellow! I use it to carry our passports as well as our bank cards, plane tickets and, our money. ** The makeup bag and the passport case were gifted to us by Bizou. However, all opinions are ours and are 100% authentic as a way to inspire each and every one in our day-to-day lives. The Sparks and Bloom sisters swear by this!